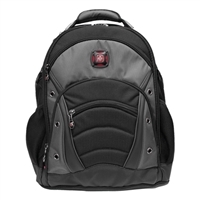 From the maker if the Genuine Swiss Army Knife, the SYNERGY back pack is perfect for the young executive or student on the go. Ample compartments and pockets for storage are provided to organize and store all of your on the go essentials; while the exclusive SwissGuard computer pocket provides secure protection for up to a 16" widescreen laptop computer. The CaseBase Stabilizing Platform keeps the SYNERGY upright when not on your back. 9" x 15" x 18"